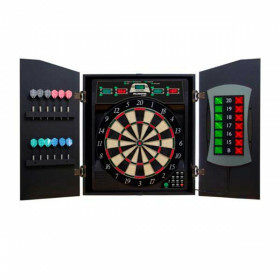 Get a game with attitude in this Arachnid CricketPro 800 dart board with talking heckler. Play sloppy, get owned by the game. 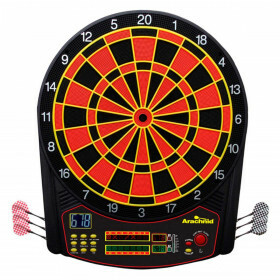 The Arachnid Cricket Pro 800 Talking Electronic Dart Board is the latest from Arachnid. Expanding on the success of the tournament quality CricketPro 750, Arachnid has delivered with the CricketPro 800. 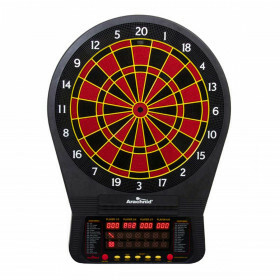 Offering 40 games on a regulation 15.5-inch target area, this dart board does it all. 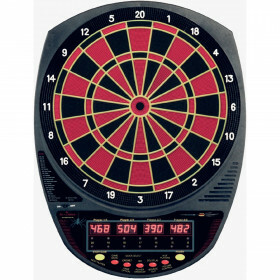 The CricketPro 800 also boasts the same micro-thin segment dividers found in Arachnid arcade systems, which dramatically reduce bounce-outs for true tournament quality play. What sets the CricketPro 800 apart from the CricketPro 750? X/O Cricket DisplayMaking Cricket scores even easier to read is the biggest advantage. The CricketPro 750 used a series of color changing LEDs to track Cricket scores while the CricketPro 800 uses the traditional /, X, and O Display. 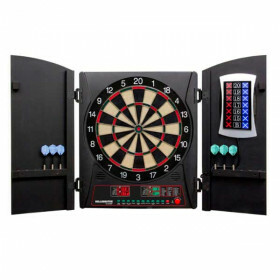 Heckler Option Another feature that really sets this dart board apart is the hilarious Heckler Feature. 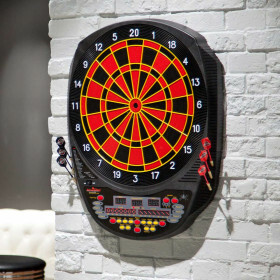 The Cheerleader offers praise for precision dart throwing and a great game; the Heckler dishes out comical sarcasm for sloppy effort. The more players you have, the more everyone will be laughing. This feature can be easily turned off for serious tournament play. If Cricket is your game, the CricketPro 800 offers seven different variations of Cricket. 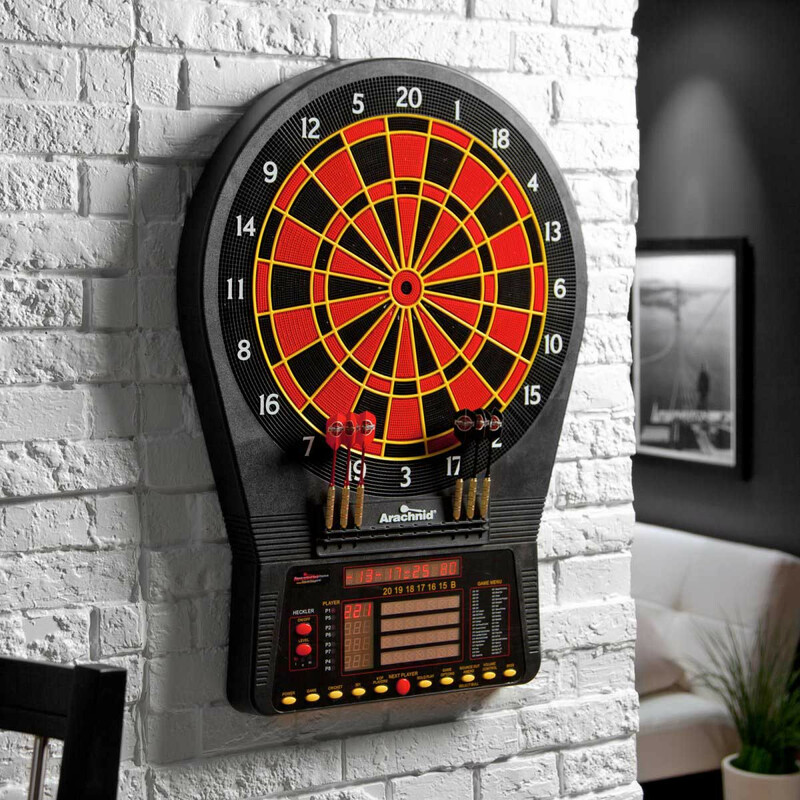 Once you and your friends begin playing, the scores are clearly tracked by an X/O Cricket Display. They are unlit when no marks are on the board, and change from /, X, V as sections of the board are closed. A handicapping option will level the playing field so even players at different skill levels can go head to head. Turn on the solo player feature for some serious practice time. PLEASE NOTE: The tips and shafts are not under warranty. These parts of the dart are prone to breaking during normal use and are not covered.